Nike VaporMax Plus is a fusion of an attractive design and innovative technologies. With many colorways to choose from: starting from traditional black, white, and silver, to gradient-toned and vibrant uppers, the shoe offers superior cushioning and comfort both for men and women. The shoe offers amazing comfort, cushioning, and stability (read more about best stability running shoes). It features a molded mesh upper, which is super soft and super plush. Some reviewers claim that it feels like a neoprene material. A TPU cage gives more structure and stability to the shoe. There is a reflective 3M detailing along the center from the toe up to the tongue, and we can see a VaporMax logo on the tongue. Also, there is a molded toe wrap and cotton laces. On top of that, there is a synthetic Nubuck overlay on the heel and a black nylon pull tab for easy on/off wearing. Also, there is a Nike Swoosh on the back, and a VM Air logo is located in the heel area. A true pride of the sneakers is a full-length Nike VaporMax Air sole, which provides perfect cushioning. A rubber outsole features integrated lugs that give good traction and durability. This shoe with an extraordinary design looks magnificent. 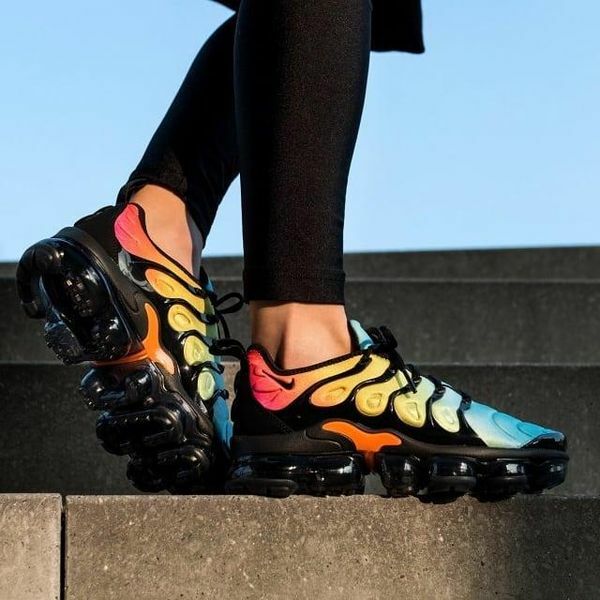 Aside from looking chic, the shoe features lightweight air cushioning and an ultra-responsive outsole – a VaporMax revolutionary heel-to-toe outsole. So, you feel awesome while running. A combination of colors in this shoe looks alluring, however, this is not the only thing that makes the shoe unique. The Nike Air VaporMax Plus delivers a lightweight and bouncy ride, a foam midsole gives responsive cushioning, and a compression molded upper ensures a secure fit. This model looks dope. There is a gradient black, purple, and aqua blue textile upper with white cage overlays for a great look. A translucent bubble sole makes the look even more appealing, and there are 3M reflective details, which ensure that you’ll be visible even in the dark. This shoe looks like fire, which has been tamed by a solid black cage. The design of the shoe is beyond beautiful. A molded upper gives a snug and comfortable fit, and an Air cushioning unit provides great cushioning. Also, a durable rubber tread provides excellent traction. This hybrid in a wonderful grey color features an upper design, borrowed from the Air Max Plus. The upper is durable yet breathable, and it is reinforced with a white cage. Also, it has a VaporMax Air technology, which provides top-notch cushioning, and you’ll feel great during your run. According to the reviewers, this shoe offers an awesome design and a feel that you enjoy all day. The upper is durable and breathable, besides, it is more stable thanks to the extra reinforcements. A cushioning unit gives you a feeling as if you are walking in the clouds. Women will fall in love with this great shoe. In the upper, there is a gradient of blue and pink colors, a recognized outsole makes the shoe not only stylish but also comfortable to run in. The upper is durable and breathable so that your feet don’t suffer from sweat and discomfort. Definitely, designers had tropical vibes in mind when creating its gradient upper. It reminds of a tropical sunset. However, an outstanding design isn’t the only advantage of this shoe. A compression molded upper provides a secure fit, and the upper is lightweight. An innovative cushioning technology provides adaptive support underfoot. This new silhouette is stylish, stable, and comfortable thanks to heel-to-toe VaporMax cushioning. The upper is supportive and durable, a plastic cage adds stability, and a durable rubber tread delivers excellent traction. The shoe is lightweight, but some reviewers say that the shoe is a bit heavier than the original VaporMax. A molded upper, a removable insole, and Air units make the shoe comfortable to run or walk in. Cushioning is amazing thanks to a Nike VaporMax Air cushioning system. The sole consists of Air Sole units, which are cushy, flexible, and they provide air support in those places that are important when running. The shoe provides good ventilation, but some buyers say that it is less breathable compared to the original VaporMax. Thanks to a TPU cage, cotton laces, integrated lugs in the outsole, the shoe is supportive and secure. Nike VaporMax Air Technology means that Air Sole units are located in the midsole beneath the heel and/or in the forefoot area. These units compress to reduce impact, and they come back to the original shape quickly. This technology makes the shoe lightweight, flexible, and durable. People, who embrace the VaporMax, will love this model. This shoe is good for flat feet, it gives good structure, cushioning, and comfort. It can be both a running or a casual shoe. So, if you love a fusion of style and functionality, go for these sneakers!